This is a medieval silver Hardi d'Argent, of King Henry IV - VI. Stuck in Aquitaine from 1399 - 1453. It bears a crowned half-length figure of the King, brandishing a sword. ERIC R. ANGLIE (Henry King of England). Long cross pattée with lis and lion in alternate angles. FRA-CIE-DNS-ACI (France and Lord of Aquitaine). 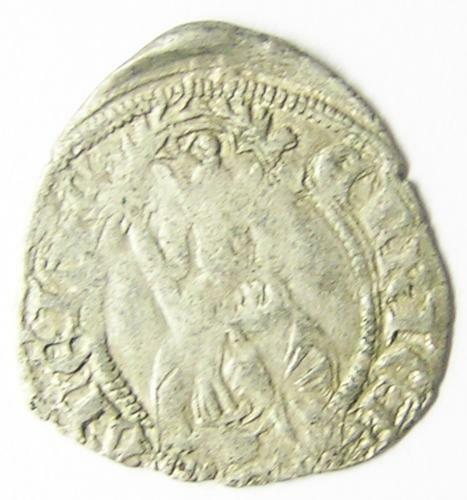 This coin was struck in Aquitaine during the Hundred Years War for use in English held territory in France. DATE: 1399 - 1453 A.D.
ATTRIBUTION: SCBC 8147; Elias 233e; Duplessy, Féodales 1140; Boudeau 517 (Henry IV); Poey d'Avant 3120 (Henry IV).